I've had great luck with my Halloween picks this year. This book was a great little find. I haven't read this author's Drake Chronicles series yet, but I'm now interested in checking it out after reading Haunting Violet.Normally I don't like to write summaries for book reviews, but since the actual summary doesn't really clue you in to what's going on, I'm going to break it down for you.1. It's a historical. I was surprised, but in a good way. The setting was perfect for adding to the creepy vibe. There aren't too many extra details to get bogged down with, so even if you don't like historicals, just focus on this book being a ghost story first and foremost and you should get into this one, no problem.2. The main character has a whacked-out mom who drags her around to help with the "fake" seances that they're hired to perform. I enjoyed seeing the amount of effort they put into making the fake seem real.3. Guess what? The daughter actually has a real ability to see ghosts, throwing a bit of actual supernatural into the sham seances. Needless to say, real ghosts cause a lot more trouble than fake smoke and mirrors do.4. 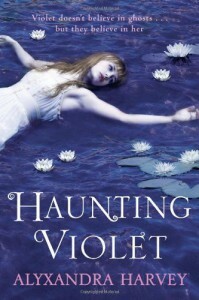 A dead girl shows up, begging Violet to solve her murder. Some parts of the mystery were easy to solve, but this time, I was clueless as to who the actual murderer was, even though I was doing the *smack forehead* afterward because I should have figured it out. Props to the author for sticking it to me at least a little bit.5. Colin was charming. That is all. Irish brogue for the win.